So I've been in a band with my guitarist now for about 6 years since we met in high school. We came pretty close to having a very solid band but due to some problems with our singer, everything went to crap and we haven't landed on solid ground yet. Now my friend the guitarist is having a kid and it's slowed things down a lot. It was sort of a bittersweet feeling because I know that would mean a lot of time lost with the band and canceled practices which have already started. I've come to accept the fact that things won't be the same and have started looking for another project. I've found something I really like but I don't want to just drop everything with my buddies who I've jammed with for a long time so what I am trying to do is have them both. My top priority would always be the new band but I get to jam with my friends and have something more serious going on. My dilemma would be that I only have 1 kit and no car to be moving it back and forth from each space. I can't make my own house headquarters for practice because I dont have the space to do it. My last resort would be to find a cheap but good sounding drumkit to have at my other band's space. I would just have to move my cymbal bag between each practice. I'm not too savvy on drum kit sounds so I was hoping someone/anyone could point me in the right direction for a cheap but decent sounding drumkit. I have already started scouring the classifieds for something used but have only found a Tama Rockstar for 125 bucks which I didnt think was too bad. I had one before my current Ludwig setup. If anyone has seen some really good deals in the Chicago land area please feel free to suggest them to me. In the meantime I have also started eyeing the ddrum kits. They are very appealing to the eyes ( at least to me ) but I have never played one. Any thoughts??? Guitarfool, everything I'm hearing is that ddrum has cleaned up their act on quality control, but just make sure you can personally evaluate any ddrum kit. Of course, that would apply to any used kit as well. I got my Pearl Forums off craigslist for 100 bucks. No hardware. It turns out they are a few years old, made in Taiwan, and a cut above the ones that are coming out of China. They'll get the quality together in a few years, but the first couple years in a new country are always spotty in quality. Here's what I'm seeing on craigslist out here in LA. Many, many beginner drumsets from current college kids who left the drums stacked in the garage and now need the moola. However, you must be a fan of black drums!! If I would have been more patient, I could have picked up an Export at a Very nice price. 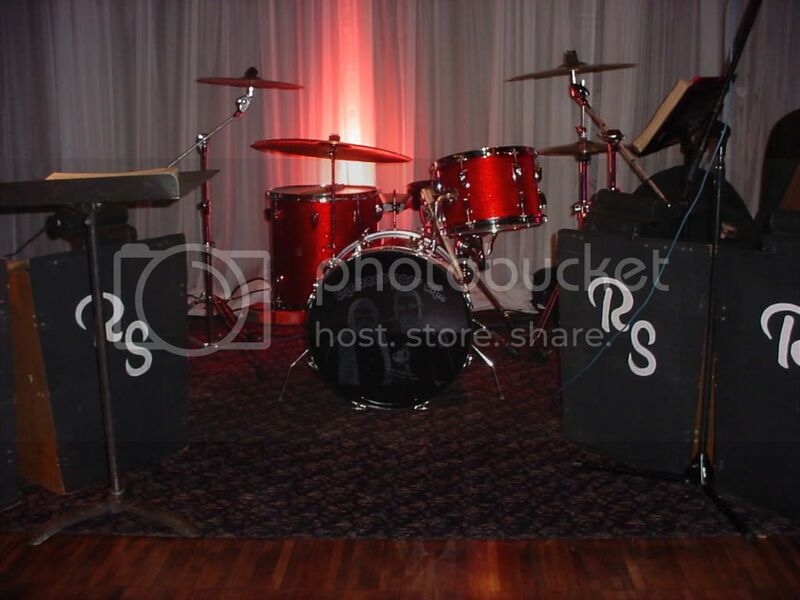 I've always wanted a white drum kit. Idk why. A friend of mine who works at Sam Ash told me he's heard a lot about the lugs of ddrums breaking on these kits so Idk what to do. I've been checking out the Pearl Visions as well. A few words of advice as I have been in a similar position. 1. An inexpensive back-up drumkit is a great thing to have - especially one set up and ready to play at the practice space. I sit down at the practice after a gig ready to play while the rest of the band is setting up their gear. I've also hauled one kit btwn multiple (gigging) bands for many years. Not fun and not efficient. 2. Choose the right config for your needs. I bought a set that had 10, 12, 14, w 18 kick to practice at home while my primary kit was always bagged for gigs. Turned out that the back-up drumkit was too small/quiet once I took it to the band house. Fortunately I was able to use a spare kit that is always set up. I am currently selling the smaller kit. I tend to look at situations in a different light. Certainly, you'll find something by way of a 2nd kit for practice but, what occurs to me is what are you going to do when the Band demands all of your time and you ultimately end of leaving your buddies? I played with a bunch of my buddies in high school, but by the time we were all out of high school most of them started pursuing other things. Our bass player quit playing during college (and has never taken it up again), one guitarist got drafted and went to Nam, lead singer went on to another band, and so did I. I'm still friends with all of them to this day, I just don't play music with them anymore and haven't for years. I think that's sort of what you're seeing GF. As your friends are getting older they're getting other priorities, and you're the one that wants to continue with his music. I think pursuing another more serious band is probably the route for you to go at this point, and you can still jam with your buddies once in awhile too. As to the second kit, many of us have second (or third) kits for just that reason. I leave one kit set up in church, and another at my band's practice space. Ddrum seems to have gotten past the hardware issues from what I've been hearing, but I always recommend that you stay with a top name brand kit. If you buy a used ddrum kit, how would you know if it was made during the time the company was getting a bad rep? There are plenty of used Tama, Pearl, Mapex, etc kits out there. Take your time to find the right one that appeals to you, at the price point you want to pay. I think if the economy continues the downslide, which many economists are predicting for 2009, there will be even more used kits available. I've been looking for used on a couple sites and the selection at the moment is very slim. It turns out I am going to need a kit very soon as I will be joining another band and want to keep the spare kit in the new space. The only thing I would be moving is a cymbal bag minus the ride since I own 2. I also found a site that will work perfectly since they accept 4 payments instead of a lump sum. Thanks! Alot of good points. I think I've already come to accept the fact that this person is going to have bigger priorities but I don't think he's ready to give up playing altogether. I'm going to make this other band a priority for sure but will continue as much as possible with the old band. Either way I get more practice! :-) I've started looking into other kits besides Ddrums that actually sound a lot better. I think the aesthetics of the kit is what drew me in more. Good comments on both the drums and the bands. If you are set on playing in both projects, then you should go with gusto. But if you are up in the air, then maybe you can give it some time before you purchase. I've wracked up time in over 20 bands/projects, but I can say with certainty that the last 3 I've played with (2 of which are still going strong) were the best. So always look for the challenges and opportunities - and most importantly - network! If one band stops playing, you may get the call from friends of your ex-band mates. A good attitude and some determination will keep you playing in bands for as long as you want. So after doing some research and looking some of the advice given to me here and from some other friends I've brought the list down to about 3 drum kits. #1 on my list would be the Pearl Vision VX kit. I love the tone and boom of the bass drums. The only thing I am not liking is the selection of colors from the place I'm buying it from. It's either black or wine red which is the color of my current kit. The other kit is a Gretsch Catalina Maple kit. I'm not too sure about the hardware or the sound of the kick on this. I'm headed to a store to see if I can try them both out but I am pretty close to buying one of these. Thanks for the advice! Oh, I forgot to mention that the Pearl kit comes with some hardware included: kick pedal, hi hat stand, and a cymbal stand. Granted, they are probably all very low quality hardware but it still saves me some money and when I play a show I will switch it up anyhow. I just placed my order. Now I play the waiting game to see if I get approved. Last edited by Guitarfool5931; 01-19-2009 at 09:51 PM. I had just went to another store before ordering from this site that wanted to charge me around 1300 just because it included the hardware. So I am glad I ordered from this site. I'm also a little scared to try out the toms and bass drums on these as I had not realized they were birch with basswood. Hope it doesn't make too much of a difference. So I took the day off to wait for my drumkit here at home. Don't fail me now UPS!!!! The waiting is the hardest part! Oh, and I don't think you've got much to worry about concerning the birch/basswood shells. The basswood plies should boost the low end tones a bit, while the birch plies should accentuate the higher tones, and give a great attack. Just don't Attack the UPS driver when he shows up. He doesn't understand the urgency in your demeanor, atm.